I am a beginner for using GATK. 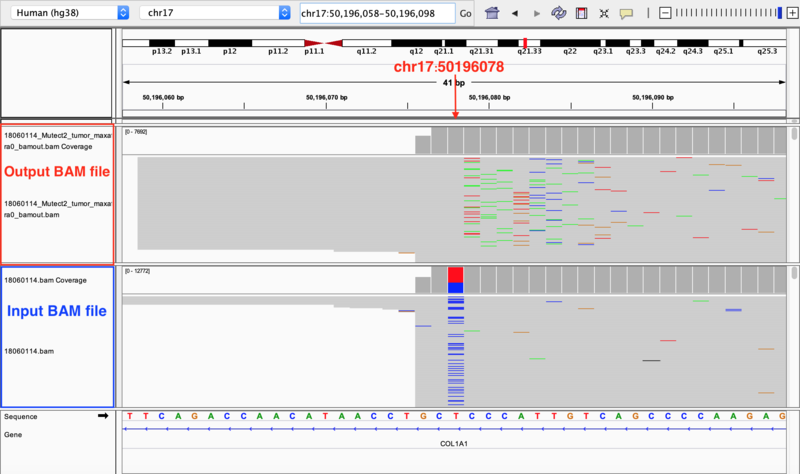 I performed the amplicon-based target sequencing and then I used the GATK4-MuTect2 to call variants. However, when we compared the variants from GATK4-MuTect2 with those from VariantCaller on Ion Torrent Sever, we found some inconsistencies. Therefore, I generated the bamout and found that some variants seem to be realigned and therefore they did not be called (see figure chr17:50196078). 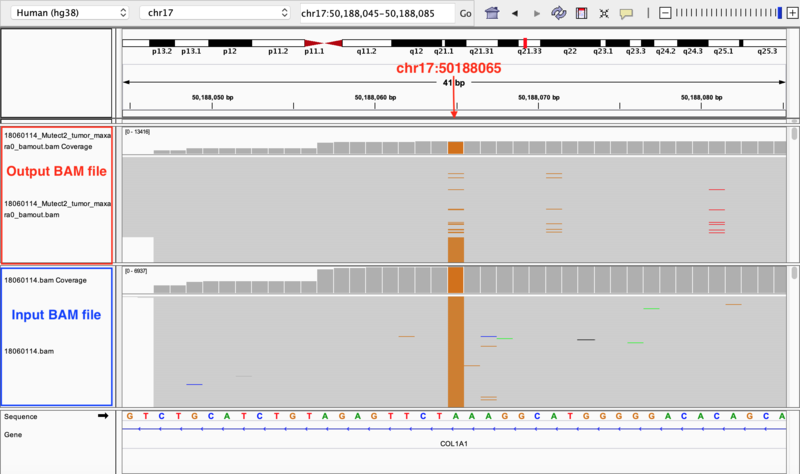 In other case, the allele frequency (AF) is homozygous in both input bam file and bamout, but the allele frequency (AF) is heterozygous in the vcf which is shown below and in the figure chr17:50188065. Your advise is highly appreciated, and look forward to your reply. @CYWang Could you produce a small bam file centered around these two cases, with about 1000 bases on either side and post here? These are my small bam file around these two cases. @CYWang Thanks very much! I will look at these this week. We don't have a lot of experience with amplicon sequencing and I think it's quite possible your data will help us find an edge case that we haven't considered before. @davidben Thank you for the positive reply and happy new year!! @CYWang I was able to reproduce your error and I think I know the cause. The solution, if I'm correct about the cause, will involve some work in the GATK assembly code. This could take a few weeks but I'm optimistic that we can resolve it. @manba GATK 4 Mutect2 is fine for amplicon data but we are perfectionists and strive to fix every edge case. We are very grateful for the help of users who report these to us. Dear @davidben I'd like to ask the current status of the amendment of the algorism to improve the edge case. Your reply is highly appreciated! Thank you. @CYWang If my initial guess about the cause works, I have scheduled a couple of hours tomorrow to fix this. If my guess is wrong, it's hard to say but I might at least have a better guess as to the difficulty tomorrow. @CYWang I reproduced the error and the guess seems to have been correct. I need to test the branch that fixes this a bit more to make sure it doesn't harm Mutect2's performance somehow. Dear @davidben, Thank you for the positive results and i saw that the GATK 4.1 had been released so I'd like to ask if the performance of MuTect2 in this version had already been amended. Thank you very much! @CYWang It's not in 4.1, unfortunately. I will need a couple of weeks to make a version of this fix that does not introduce false positives. I can promise that this is a high priority because the same issue in the GATK assembly engine is holding back some important mitochondrial analyses here. Dear @davidben , thank you for your prompt reply and I understand. I look forward to the amended version. Really appreciate your help! @CYWang Please try the --recover-all-dangling-branches argument in the latest release. Dear @davidben , I will try the command. Thank you!